Roman Dmowski was born in 1864. He eventually became the leader of the Polish National Democratic Party. 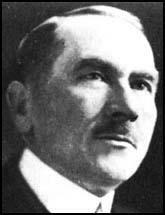 Dmowski regarded Germany as Poland's main enemy and believed the best way to achieve a unified and independent Poland, was to support the Triple Entente against the Triple Alliance. Jozef Pilsudski, a nationalist leader based in Galicia, disagreed and began building a private army that he hoped would enable Poland to fight for its independence from Russia. Whereas Pilsudski was a socialist, Dmowski was hostile to liberal democracy. In August 1917, the Allies established Dmowski as leader of the Polish National Committee. They also committed themselves to a Polish state and in November recognised the Polish National Committee as the future government. However, after the First World War, it was Jozef Pilsudski who emerged as Poland's national leader. Roman Dmowski died in 1939.